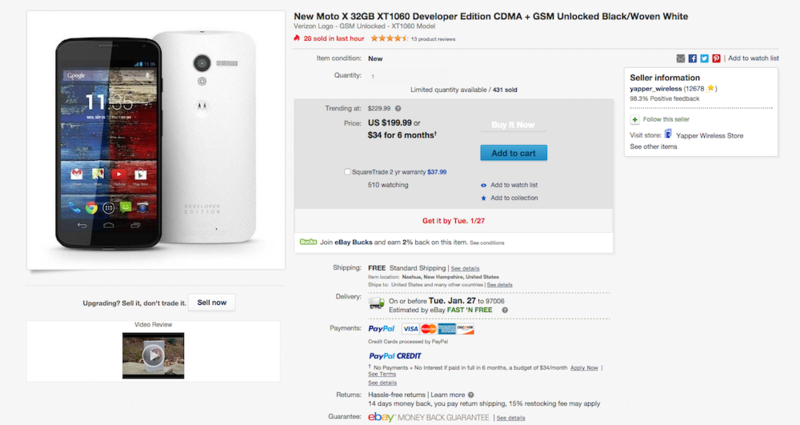 For a limited time, you can pick up the Moto X (1st Gen) Developer Edition smartphone through eBay for just $199. This model of the Moto X comes unlocked, perfect for developers and users who enjoy tinkering. While you would not hear me walking around the streets and recommending 2013’s Moto X, for only $199, this could be a solid deal for anyone who does not mind older phones. The device comes with a 4.7″ HD display, Snapdragon dual-core processor, 2GB of RAM, 32GB of storage, 2200mAh battery, and should receive a timely update from Motorola to Lollipop at some point.